Doxie Flip - the modern scanner for creativity and history. Doxie Flip is a new kind of flatbed scanner, designed for capturing your creativity and history. Doxie is perfectly designed and sized to capture photos, memories, creative ideas, surfaces, fabrics, and pocket notebooks. Plus, Doxie is cordless and lightweight, so it's built to travel - no computer required. Doxie's unique removable lid lets you flip Doxie over and place it directly on your originals. Line up scans perfectly and see your scan as it happens with Doxie's transparent scanning window. Scan everything - you're only limited to your imagination! Doxie is perfectly designed for photos, memories, old albums, creative ideas, pocket notebooks, and things you need to protect. Doxie Flip delivers brilliant image quality up to 600 dpi. It's easy - place your original on the glass (or, remove the lid and place Doxie on your original), then push Doxie's big green button to scan to the included SD card. 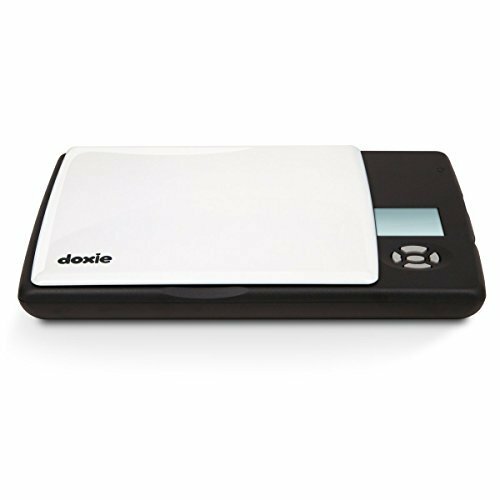 Doxie Flip scans originals up to A6, so it's perfectly sized to take with you. And for larger originals, Doxie's AutoStitch feature seamlessly merges multiple scans together into one big image. Doxie's removable lid makes scanning everything easy. Import scans right to your PC or Mac with Doxie's included custom software, which makes it easy to organise, sort, stitch, save, and share your scans.